Mele for Royal Order of Kamehameha by Mrs. Pa, 1925. HE MELE NO KA AHAHUI KAMEHAMEHA. E ola e ka hui o Kamehameha. Ka Poli Lauae o Makana. Ka Nupepa Kuokoa, Buke LXIV, Helu 42, Aoao 2. Okatoba 15, 1925. Kuu Lei Mokihana poina ole. Ka Hoku o Hawaii, Buke 7, Helu 13, Aoao 4. Augate 29, 1912. Romeo and Juliet of Hawaii? 1912. 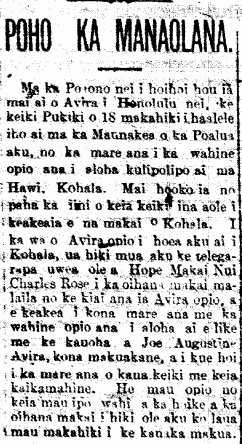 This Saturday Avira was returned to Honolulu nei; he is an 18 year-old Portuguese boy who left aboard the Maunakea on Tuesday to marry the young woman who he is deeply in love with, in Hawi, Kohala. This desire of the boy would have perhaps been fulfilled were it not interfered by the police of Kohala. When the young Avira arrived in Kohala, a wireless telegraph from Deputy Sheriff Charles Rose had already reached the police there, to watch for the young Avira and to stop him from marrying the young girl he loved, according to the request of Joe Augustine Avira, his father, who was opposed to the marriage of his son to this girl. According to the statement of the police department, these two sweethearts are children that have not reached the age of adulthood. Ke Aloha Aina, Buke XVI, Helu 5, Aoao 2. Feberuari 3, 1912.